The Last Frontier from New World Library is available at all major booksellers and ebook retailers. Selected for Book of the Month by Eben Alexander, author of Proof of Heaven on his official web site. 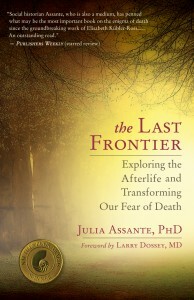 The Last Frontier explores all phases of death, dying, the afterlife and how to communicate with those who are living it. Above all it is a critical investigation of what happens when we die. 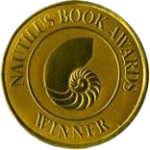 That means it is not based on religious teachings or on spiritual traditions but on research drawn from several sources: from consciousness research, Near Death Experiences and Nearing Death Awareness studies; from physics, quantum biology and parapsychology; from the records of past-life therapists, medical personnel and bereavement counselors, and from the many thousands of published testimonies people have given of their personal communication with the dead. It is also based on my own experience working with the dying and the dead as a professional medium. The social historian side of me examines the various constructions of the afterlife from ancient Egypt and Mesopotamia to the present to show that cultures produced different versions of the afterlife to meet specific socio-political agendas. The afterlife religions currently teach are recent inventions in the course of humanity’s long history. So is sin, as we understand it today. In fact, the heaven-and-hell notion of the afterlife developed centuries after the Books of the New Testament were written. For an overview of what The Last Frontier covers, click here to see its Table of Contents.